Parents are always looking for ways to keep their kids safe. 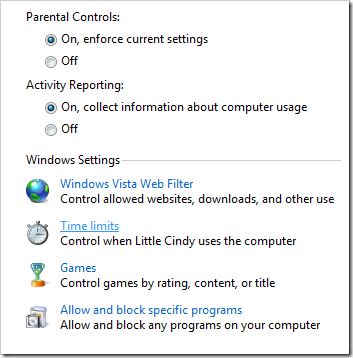 Windows Vista has added a cool feature called Parental Controls which are very easy to use which help when it comes to computers and the Internet. About a year ago I covered how to use the controls to filter unfavorable Websites. While it is great to have your children use and learn the latest technology, spending too much time with video games and surfing the Web can be unproductive. Ultimately it is the parent’s responsibility to monitor their children’s activities but today’s tip will show you how to utilize a great tool in Vista to help out. This feature of Vista actually allows you to control the time a user can access their account. Open Control Panel and click on Set up parental controls for any user. Next, choose your kids account … or whoever you want to limit time on. 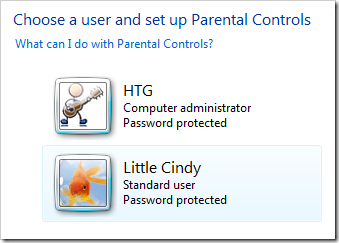 Make sure Parental Controls are on then click on Time Limits under Windows Settings. Now simply select the the schedule for time allowed on the Internet and when it will be blocked then click OK. That is all there is to it! While you child is logged into their account there will be an icon in the lower right corner by the clock showing Parental Controls are enabled. Also, as the time gets closer for them to get off the computer, balloon notifications will appear in periodically telling them how much time is left.